Bootleg liquor has left 29 people dead and has resulted in more than 100 others being treated in hospital in northern India, officials in the state of Uttar Pradesh said. The majority of victims were those who went to see a game of cricket on Sunday evening in a village near the state capital, Lucknow. There were about 200 spectators at the match, AP reported, citing government official Anil Garg. Conflicting reports indicated that the number of deaths was 17. Fourteen of those admitted to medical facilities are in serious condition, with some of them on artificial ventilators, and some have lost their eyesight, according to local doctors. 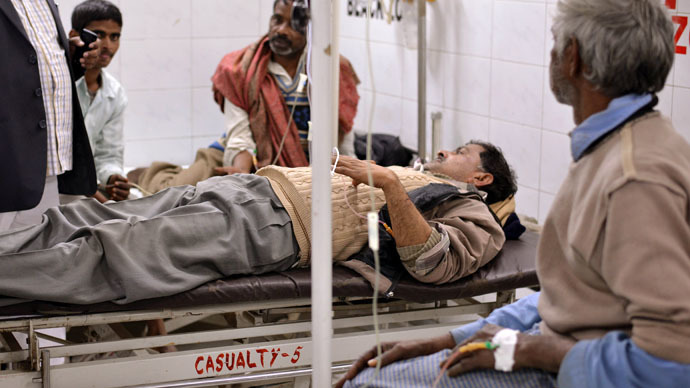 "The symptoms gave a clear indication that these patients were served methyl alcohol, which despite being toxic is sometimes mixed with ethyl alcohol to make a brew cheaper,” Dr Kausar Usman, head of the trauma center at Lucknow's King George's Medical College, told AP. Security forces have arrested the owner of the shop that sold the homemade alcohol. Containers of chemical substances have been found at the premises, and have been sent to the lab for testing. Villager Rajesh Kumar, whose two older brothers are in the hospital, said that the shop had always sold cheap liquor, and many came from neighboring villages just to buy the alcohol. Six policemen have been suspended for allegedly taking bribes to hush up complaints against the shop, the state's top official, Chief Minister Akhilesh Yadav, said, adding that a "drive will be launched against those involved in the illicit liquor trade." A dozen officials have also been suspended from various local departments over negligence, government spokesman Rajendra Chaudhary told AFP. "The guilty will not be spared," he said. Incidents linked with illegal alcohol are common in India, with almost 170 people dying in 2011in the eastern state of West Bengal. In 2009, about 90 were killed by bootleg liquor in Uttar Pradesh, and over 100 in Gujarat.